The Hong Kong Philharmonic’s concert presentation of Wagner’s Ring Cycle over four years reached its third instalment, Siegfried, on Sunday. Joining Music Director Jaap van Zweden were some familiar faces who had appeared in Das Rheingold and Die Walküre in the same or different roles, and new faces appearing for the first time. The combination, shorn of the trappings of a fully staged performance, nevertheless delivered an afternoon of exhilarating and powerful musical drama that more than vindicated the orchestra’s ambitious plan. Of the three acts of the opera, the first is the least exciting. A good part of it is a parade of Siegfried’s abusive and contemptuous treatment of Mime as he recounts how he came to bring him up as a “foster” parent, sprinkled with plenty of unsuccessful sword-making. Not that Mime deserves any sympathy, as he has his own ulterior motives, but against Siegfried’s gratuitous hostility and disdain he does cut a pitiful figure. Simon O’Neill has a fine and expressive voice but perhaps a little light for the truculent Siegfried who knows no fear, hardly evoking the revulsion the character deserves. He struggled to project above the carpet of insistent humming on low strings, brass and woodwinds. David Cangelosi, returning to the role of Mime, carried the day. Dramatic and compulsive, he either deflected or returned Siegfried’s volleys of insults and derision and even gave the overbearing Wotan, now disguised as the Wanderer, the occasional run for his money. His single-minded focus on recovering the ring seemed a source of persistent inner strength. Matthias Goerne, the mainstay of all three operas so far in the cycle, has a dark tone certainly fit for the role of Wotan. Loitering in the low register, his delivery verged on being heavy rather than authoritative. Although this might have done little justice to Wotan the blustering, all powerful deity, it was nevertheless appropriate for the Wanderer. The opening of the second act is rather grim, replete with suspense as Alberich lurks outside the cave in which Fafner, in the form of a dragon, is resting. Bass-baritone Werner van Mechelen portrayed Alberich well – small-minded and obsessive, perhaps even neurotic – providing an effective counterpoise to the Wanderer. O’Neill came to his own with smooth lyricism, showing a glimpse into the tender and vulnerable side of Siegfried, as he yearned for his mother against the bucolic background of chirpy woodwinds and gentle horns. Falk Struckmann as Fafner and Valentina Farcas as the Woodbird both looked in only for a short time, but added colour and variety. Although Struckmann didn’t quite breathe fire and fear, his commanding boom rang in the auditorium from the back of the stage, briefly slowing Siegfried’s advance. Farcas was delightful and vivacious, vocally soaring and diving at will with ethereal lightness. The third and final act was what brought home the bacon. Wotan the Wanderer (and bully) made a nuisance of himself waking up Erda to seek her advice. With steely nerves and a solid voice to boot, Deborah Humble targeted his questions with offhand but forceful ripostes. After recklessly bidding Wotan not to stand in his way, Siegfried found Brünnhilde. Heidi Melton seemed to be standing a long time waiting for Siegfried to finish his soliloquy, but boy did this heighten the impact of her entry! She broke through rippling harps and tremolando strings in an earth-shattering and majestic cry of “Hail to thee, Sun!” From here on, this velvety sound box commanded our rapt attention until the end, throwing us up in the air with high emotion, and bringing us down with gentle lament. Jaap van Zweden kept the orchestra on a tight rein, doling out clear gestures to signal the effect he wanted. No detail was left to chance, nor any phrase misjudged. Orchestral colours were superb and balance among the various parts was well maintained. Integration with the singing was seamless and the artistry of the players was evident. With the help of set and props, this would be close to what Wagner conceived as Gesamtkunstwerk. When the Hong Kong Philharmonic and its music director Jaap van Zweden embarked on Das Rheingold in 2015 to inaugurate their first ever Ring cycle (to be given one opera each year in concert form), few would have expected that the venture could garner such an amount of international attention. The widespread critical acclaim is, in part, thanks to the live recordings released by Naxos, which have helped to bring their performances of Rheingold and last year’s Die Walküre to a much wider audience. But it is also true that van Zweden has, within a comparatively short time, transformed the Hong Kong Philharmonic into a Wagnerian orchestra to be reckoned with, and that the level of casting has been consistently high (including some interesting choices, such as Matthias Goerne’s Wotan) with almost all the singers being able to deliver the goods. Such notable achievements would have won over anyone who managed to attend these shows. Happily, such excellence in music-making was once again very much in evidence at their concert performances of Siegfried. In fact, van Zweden’s interpretation of this third instalment was arguably even more inspiring – he displayed a magisterial command the structure of each of the 3 acts, such that both the architecture of the music drama, as well as the many glories of Wagner’s splendid but intricate orchestration, were revealed in full on this second performance (January 22, 2017) at the Cultural Centre Concert Hall. Orchestral balance was perfectly judged and not a single phrase was left to chance. Yet, nothing sounded overly calculated, and the performance was brimming with vitality and expressiveness. The Hong Kong Philharmonic (with the help of a few additional players seconded mostly from German orchestras) was also in enviable form, with members playing with total commitment and thrilling intensity. It was only until the very end of this musical marathon did a slight degree of fatigue become apparent. In all, this is another magnificent performance that fully justified the ambitious undertaking. Tackling the cruelly demanding title role for the first time, Simon O’Neill sang with exceptional stamina, admirable musicianship as well as a fresh, clean tone all the way to the end, which is a considerable feat in itself. The voice is perhaps a tad small for the part (he was occasionally swamped by the on-stage orchestra, especially when the brass was at full throttle) and his interpretation lacked the ultimate sense of bravado that one would have expected from a young, intrepid hero. Still, this was an auspicious role debut. Returning as Mime, David Cangelosi almost stole the show with his tremendously characterful and generously-voiced performance, which won a huge ovation during curtain calls. Indeed, his Mime was the most all-rounded portrayal in the midst of this estimable cast. Compared with his role-debuting performances as Wotan in the first two operas, Matthias Goerne’s Wanderer was dramatically more involving and he employed a darker, but always noble, tone for this final outing of the role. His intelligent treatment of the text as well as the smooth phrasing was particularly treasurable in a part that has been subjected to quite a bit of blustery vocalism. That said, the Wanderer’s Act 3 music does seem too strenuous for his type of voice and one wonders if it can hold up well in a fully-staged production of the entire cycle. Werner van Mechelen was a sturdy Alberich, although the character’s bitterness could have been emphasized more strongly. Last year’s Hunding, Falk Struckmann, lent his sonorous voice to Fafner this time, but he was somehow not very menacing, despite all those growls he made during the battle with Siegfried. Valentina Farcas was a lyrical Woodbird who made every word tell, and the Erda of Deborah Humble (another returnee) was remarkably well sung, even if one would have looked for richer low notes in this music. Heidi Melton, last year’s Sieglinde, has now graduated to the part of Brünnhilde, and she was certainly up to the challenge, singing with a firm and often radiant voice all the way up to the high Cs. That said, she is not (yet) a genuine hochdramatische Sopran and one missed the breadth of tone as well as the imperious command of the top register that were the hallmarks of certain renowned interpreters of the part. Nevertheless, she and O’Neill was vocally and temperamentally quite a good match in the final duet. Naxos engineers were again busily working behind the scene, and another successful live recording is likely to hit the shelves later in the year. Most conductors make their initial mark in a symphony orchestra with Beethoven. Many then move on to Mahler. But only the truly hardy — or perhaps foolhardy — try to make a meaningful case for Wagner in the symphonic repertory. Like Edo de Waart before him, the Hong Kong Philharmonic’s current music director Jaap van Zweden has sailed through Beethoven and Mozart. Unlike De Waart, whose efforts to present Hong Kong’s first Ring cycle in concert were shorn by budgetary scissors, Van Zweden has now passed the three-quarter mark of his first foray into Wagner’s epic, a four-year survey backed by a healthy government subsidy, a recording deal with Naxos and a cast that would be the envy of any opera company. Matthias Goerne, who began his role debut as Wotan in the orchestra’s Das Rheingold in 2015, returned on Thursday in the Philharmonic’s Siegfried with David Cangelosi and Deborah Humble, longtime veterans of Mime and Erda who’ve also maintained those characters in the Hong Kong series. The main attraction, though, was the presence of Simon O’Neill, a veteran Siegmund now making his debut in the title role. Where Goerne’s Wotan has been a triumph of smart singing over sheer power — the right text shadings and enunciation can still cut through Wagnerian orchestration — O’Neill sang like an athlete trained well beyond the requirements of the actual event. It was to Heidi Melton’s disadvantage that when her Brünnhilde first appeared in Act 3 her saviour was well primed and still showing no physical effort. One could hardly say the same for the orchestra. Where Van Zweden’s Beethoven has drawn its power in part from dynamics and almost idiosyncratically fast tempos, his Wagner summons its intensity not from surface effects but from deeper within. It was, for the first two acts, such a model of restraint that one almost wished the orchestra was louder. But from about the time of Brünnhilde’s appearance the orchestra’s stamina seemed to give out and the intensity began to flag. Siegfried, twice the length of a normal symphonic programme, is already a marathon. Next year’s Götterdämmerung moves the finish line still further. 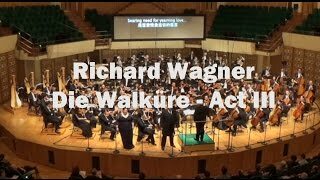 I had missed the earlier two episodes in the new Naxos release from Hong Kong of Wagner’s Ring, but noted that they were generally well received by other critics and looked forward to encountering the orchestra and conductor in what is universally acknowledged to be the most difficult of the Ring operas both to cast and to perform. Indeed the first studio recording of Siegfried had to wait until 1962, when John Culshaw set it down as part of the Solti/Decca Ring; and in his autobiography the producer gives a vivid account of the problems he encountered with the casting of the leading role, which seem by later report to have been even more horrendous that the sanitised report he gives of the abortive contract with “our Siegfried” (now known to have been Ernst Kozub). In the end he had to resort to the use of the standard casting at that period of Wolfgang Windgassen; and subsequent studio recordings have similarly encountered problems with filling the role, only Siegfried Jerusalem for Bernard Haitink really coming close to the ideal (although Karajan seems to have short-changed Jess Thomas in the selection of the ‘takes’ used in his recording). Also, Siegfried is one of those operas which is particularly accident-prone in the theatre, which means that many of the live performances available on record fall down badly at this point. Or, to be more precise, at the end of Act One when the protagonist has not only to sing in full heroic tone over a massive orchestra but also to hammer away at his sword on the anvil in precisely notated rhythms and dynamics. Some Siegfrieds make a better fist of their percussion playing than others, but I don’t think I’ve ever heard any of them who sounds at ease at this point; and delivering heavy blows of the hammer also clearly interferes with the delivery of the voice. And it really does require an effort, as I discovered personally when I once persuaded a friendly local blacksmith in Ireland to allow me to experiment with his hammer and anvil. As each stroke is delivered there is a massive rebound, requiring considerable muscular effort to force the hammer back down for the next stroke; and the louder and faster the repeated rhythms, the greater becomes the problem. All the studio recordings overcome the difficulties by providing a professional percussionist to supply the sounds of Siegfried’s hammering, and this is also clearly the solution adopted in this performance which – although billed as ‘live’ – appears to have been made over a period of weeks without any evidence of an audience being present (not even any applause at the end of the Acts). It has become a time-honoured cliché to complain that nobody has ever been able to sing the role of Siegfried since the death of Lauritz Melchior (whose studio 78s certainly suggest the participation of an assistant percussionist during the forging scene), and to a certain extent that is true in that voices able to supply full heroic tone during the most strenuous passages of the score come but once in a generation, if then. But Melchior in his live recordings can often be astoundingly wayward in his actual singing of the part, especially in his rhythms; and, when he first began to sing the role Wolfgang Windgassen was even worse – his delivery of the forging scene in Clemens Krauss’s live Bayreuth recording might be amusing on first encounter as an example of a performance where everything seems to have gone wrong, but the sheer awfulness of an occasion where the conductor seems to be keen to get the experience over with as quickly as possible would surely never be welcome a second time around. Even the admirable Alberto Remedios in his recording with Goodall was not above altering the musical rhythm, adding a moment of silence before the start of the hammering in all his live performances (that pause was reproduced on the LP issue where it formed a side break, but on the CD transfer a musically sensitive engineer has closed the gap). All of which is a lengthy preamble to the discovery that New Zealand tenor Simon O’Neill is surely the Siegfried for our generation. He may lack the sheer heroic strength and lyrical warmth of Melchior, or the honeyed sweetness that Remedios could command, but he makes up for it with a keen sense of involvement in the meaning of the words, a welcome admixture of humour, and a precision of delivery which would put some of his predecessors to shame. The only point where I missed the sheer thrill of sound was in his final call of “Nothung!” as the sword-blade is fixed into its hilt, but this is a moment of peril for many singers (Siegfried Jerusalem in his live Met video is almost reduced to inaudibility at this point). Over recent years I have reviewed with pleasure O’Neill’s assumption of the roles of Siegmund (at La Scala, despite a clear indisposition) and Parsifal (at Covent Garden). Many Wagnerian exponents of these relatively lighter roles come to grief when making the move into Siegfried/Tristan territory; I am pleased to say that O’Neill is clearly not among them. And – another considerable bonus – he shows no signs of tiring towards the end in his duet with the awakened Brünnhilde, another point at which many of his rivals in live stage performances come to grief. In Act One he is superbly matched with David Cangelosi, who seems to me simply to be one of the best exponents of the role of Mime on record. For far too many years the part has been assigned to character tenors of varying degrees of skill, ability and voice, who have tended to treat the whining complaints of the old dwarf as an excuse for caricature. Gerhard Stolze in the Decca Ring is probably the prime example of this interpretation (although there are many others who are far worse) and it seems only to have been since around 1950 that any attempt was made to provide a deeper sense of motivation to the role, beginning with Julius Patzak for Furtwängler at La Scala. In recent years a welcome trend has been detected to cast the part with even more ‘heroic’ voices – Gregory Dempsey for Goodall, Graham Clark at several venues – and Cangelosi falls firmly into this line. But where he scores even more successfully is in his willingness to engage with the character. ‘Ein zullendes Kind’ is usually rendered as a self-pitying “starling-song” (as Siegfried terms it), but Cangelosi makes the listener realise that his sense of misery is entirely real; he is genuinely frustrated by his failure to engage the emotions of his foster-son, even as at the same time he schemes to make use of him to further his own ambitions. Some critics have complained that the two tenors, O’Neill and Cangelosi, sound too much alike here; I see this as a realisation of the dramatic situation between two characters bound together by circumstance and mutual loathing. The third participant in Act One is Matthias Goerne as the wandering Wotan, whose baritone has now acquired deeper resonance than in his younger years and has become exactly the right sort of voice for the world-weary deity. At the same time, he still has the high notes required to cope with Wagner’s often cruelly high writing, as in his triumph over Mime at the end of their scene together. He is also a tower of strength in his later scenes with Deborah Humble’s resonantly determined Erda and in his pointed confrontation with the boisterous Siegfried. Add to this the superlative playing of the orchestra under Jaap van Zweeden, and this becomes quite simply one of the best performances of Act One of Siegfried I ever hope to encounter; and to add the final touch, Naxos have managed to cram the whole of the Act without a break onto one extremely long CD side. Of course, nothing in this world is perfect, and the later Acts cannot quite rise to this same standard. The orchestral playing remains superlative, as does van Zweeden’s pacing; but the opening scene between Alberich and the Wanderer decidedly lowers the temperature. In the first place, Werner van Mechelen as Alberich is not really villainous enough; one hardly feels that he has been nursing a heartfelt grievance since we last encountered him cursing the Ring in Rheingold (when he was sung by Peter Sidhom). And I am afraid that the bass-baritone Falk Struckmann is seriously miscast as Fafner, a role calling for a deep bass if ever there was one. The distinguished ex-Wotan can reach the bottom notes in a sort of juddering growl, but the sheer sense of plumbing the depths is nowhere evident; and he is too closely placed in the opening scene of Act Two where his voice is supposed to be resounding from the depths of his cave. One could also object that the Woodbird of Valentina Farcas is also too near the microphone, but although in the theatre the singer is perforce positioned offstage there is no real dramatic reason why this should be so; and her diction is unusually clear and precise with just the right sort of piping tone. The central scenes of the Act, Siegfried alone in the forest and his final confrontation with Mime, go well; but the whole does not come together in the same way that Act One most certainly does. In the first part of Act Three, as already noted, Matthias Goerne is a tower of strength and is well matched by his protagonists; but I am not totally convinced by Heidi Melton’s awakened Brünnhilde (the role was taken by Petra Lang when she went to sleep at the end of Walküre). She has a pleasant tone; her voice certainly has the required volume, and she mercifully does not have the scything edge that Lang displayed before she was cast into slumber; but there is also an unsteadiness of tonal production when Melton presses the voice, slightly reminiscent of Gwyneth Jones in her earlier years – not so much a wobble of pitch as a coming and going of the sound, which some listeners may find perfectly acceptable. She matches O’Neill, still in fresh voice, note for note in the strenuous final section of their duet. Act Three is the only point in this Siegfried where there has to be a break between CDs; and the point chosen for this is probably one of the best that could have been selected, breaking the action just as Brünnhilde awakes to begin that duet. This means – yet another plus – that the ‘Langes Schweigen’ that Wagner marks during Wotan’s argument with Erda can be given its full dramatic measure without the listener having to get up and change over the disc. The recorded sound is absolutely excellent, and Wagner’s cues in the score for “Donnermaschine” are properly observed. We do not get the clanking of metal during the forging scene which one would expect during a staged performance (and which Culshaw provided for the Decca studio recording), but many will count this a blessing. The presentation of the CDs deprives us of text or translation – a German-only text is provided online – but good translations of the Ring are not hard to obtain. We are given a very full synopsis by Keith Anderson, properly cued even if it misses some subtle but important points (like the Wanderer concealing his identity from Erda at the opening of Act Three). This Siegfried is a real jewel in the Naxos catalogue, and even confirmed Wagnerites who have multiple copies of the Ring in their collections will want to hear Act One of this performance.